In the Fall of 2017, the City of Sturgis passed two resolutions in an effort to support the formation a Fire District and an Ambulance District, respectively. Citizens within the proposed districts were unsuccessful in garnering enough signatures, as required by law. Throughout the spring and summer of 2018, the Board of Meade County Commissioners were approached by a group of concerned citizens with a request that the County form a Fire District and an Ambulance District by resolution, as outlined in the procedures below. The first public hearing on the matter is scheduled for October 2nd, 2018, at 6:30 PM at the Sturgis Community Center. The second public hearing is scheduled for October 25th, 2018, 10:00 AM at the Commissioners’ Meeting Room in the Erskine Building in Sturgis. Citizens are concerned about sustained ambulance and fire services within Meade County- particularly the areas outlined in the proposed districts. The Commission invites your public input as the process unfolds (as outlined below). Please note that the proposed districts cannot overlay another established fire or ambulance taxing district. 34-11A-8. Conduct of election. Following the filing of the order of the board of county commissioners, an election shall be conducted as provided in §§ 6-16-4 to 6-16-6, inclusive. 34-31A-9. Time and place of meeting of resident property owners of district. Following the filing of the order of the board of county commissioners, an election shall be conducted as provided in §§ 6-16-4 to 6-16-6, inclusive. 6-16-5.1. Election on question of incorporation in districts containing one thousand or more voters. If the proposed district contains one thousand or more eligible voters as defined in § 6-16-6, the county auditor shall set a date for an election to be held within the district, or at the county seat of any county in which a portion of the proposed district is located, on the question of formation of the special district. The date may not be more than sixty days after the appropriate board declares that the application for incorporation is valid. The election shall be conducted pursuant to Title 12. The vote upon the question of incorporation shall be by ballot which conforms to a ballot for a statewide question except that the statement required to be printed on the ballot shall be prepared by the state's attorney. The election shall be canvassed by the county commission. 6-16-5.2. Election of directors or trustees in districts containing one thousand or more voters. If a majority, or if it is a water project district at least sixty percent, of the votes cast in an election conducted pursuant to § 6-16-5.1 is in favor on the question of formation of the special district, an election shall be conducted by the county auditor within sixty days after the official canvass to elect the initial board of directors or trustees. The election shall be conducted pursuant to Title 12. The county auditor shall publish a notice of vacancy no later than fifty days prior to the election. Circulation of nominating petitions may begin upon completion of the official canvass of the election to form the district. Nominating petitions shall be filed with the county auditor by 5:00 p.m. at least thirty days before the election. The nominating petitions shall contain signatures of at least twenty-five eligible voters in the district as defined in § 6-16-6. Absentee ballots shall be made available to the voters no later than twenty days before the date of election. The election shall be canvassed by the county commission. A public hearing will be held Thursday, October 25, 2018 at 10:00 a.m. in the Commission Room of the Erskine Administrative Building on said proposed West-Central Meade County Ambulance District Resolution. Notice is further given that any person, persons, or their attorney may appear at said scheduled public hearing and speak in favor of or present objections, if any objections there may be. Dated at Sturgis, SD, this 26th day of September 2018. Published twice at the total approximate cost of _____________. 34-11A-1. Petition by voters or resolution by county commissioners for establishment of district. If persons in any rural territory request to form, organize, establish, equip, and maintain an ambulance district, the petition shall be presented to the county auditor of each county in which the territory is situated setting forth their desires and purposes. Alternatively, the board of county commissioners in each county where the ambulance district would be situated may initiate formation of the district by resolution. Source: SL 1982, ch 259, § 1; SL 1998, ch 36, § 19; SL 2003, ch 181, § 1. 34-11A-2. Requirement for inclusion of municipality in district. Any municipality located within the area may be included in the ambulance district if at least twenty percent of the number of registered voters within the municipality voting in the last gubernatorial election sign a separate petition from that municipality, or if the governing body of the municipality establishes intent by passing a resolution so indicating. Source: SL 1982, ch 259, § 2; SL 1992 ch 60, § 2; SL 1998, ch 36, § 20; SL 2002, ch 144, § 3; SL 2007, ch 191, § 1. 34-11A-3. Contents of petition or resolution. The petition shall contain the suggested name of the proposed district, the area to be included, and a complete description according to government survey, if possible, of the boundaries of the real properties intended to be embraced in the proposed ambulance district. The petitioners shall also present to the county auditor a plat or map showing the suggested boundaries of the proposed district and shall deposit with the county auditor a sum sufficient to defray the expenses of publishing the notices required by §§ 34-11A-6 and 6-16-4. Source: SL 1982, ch 259, § 3; SL 1998, ch 36, § 21; SL 2003, ch 181, § 2. 34-11A-4. Certification of petition--Designation of time and place for hearing. Upon the filing of petition in the office of the county auditor, the county auditor shall determine and certify that the petition has been signed by at least twenty percent of the number of registered voters voting in the last gubernatorial election within the proposed district. If the petition contains sufficient names, the county auditor shall designate a time and place for the petition or resolution of the county commissioners to be heard by the board of county commissioners. Source: SL 1982, ch 259, § 4; SL 1998, ch 36, § 22; SL 2007, ch 191, § 2. 34-11A-5. Two or more counties in proposed district--Procedure. If the proposed district is situated within two or more counties, the county auditor of the county containing the largest area, shall confer with the auditor of any other county concerned, and shall obtain a certificate as to the adequacy of the petitions or resolution pertaining to such county. Thereafter the auditor of the county containing the largest area shall designate a time and place for hearing before a joint meeting of the boards of county commissioners of all counties in which the proposed district is to be situated and shall give notice thereof by publication in a manner provided in § 34-11A-6. Source: SL 1982, ch 259, § 5; SL 2000, ch 165, § 1. 34-11A-6. Notice of hearing. Notice of the hearing shall be given by publication two weeks in the legal newspapers of each county affected, the last publication appearing at least seven days prior to the hearing and shall include a statement of the proposed boundaries as set forth in the petition. Source: SL 1982, ch 259, § 6; SL 1998, ch 36, § 23. 34-11A-7. Conduct of hearing--Order and filing of determination. At the time and place so fixed, the board or boards of county commissioners shall meet, and all persons residing in or owning taxable property within the proposed district shall have an opportunity to be heard respecting the formation of such district or the location of the boundaries thereof. Thereupon the board or boards of county commissioners shall determine whether the proposed district is suited to the ambulance service policy of the county, or each of such counties, as a whole, determine the boundaries of the proposed district, whether as suggested in the petition or otherwise, and make a written order of such determination which shall describe the boundaries of the district and be filed in the office of the county auditor or auditors of each county in which such district is situated. Source: SL 1982, ch 259, § 7. Source: SL 1982, ch 259, § 8; SL 1998, ch 36, § 24. 34-11A-9 to 34-11A-11. Repealed by SL 1998, ch 36, §§ 25 to 27. 34-11A-12. Board of directors--Election--Certain persons ineligible. Permanent organization shall be effected by the election of a board of directors consisting of not less than five residents of the district. No employee of the ambulance district may serve as a director. Source: SL 1982, ch 259, § 12; SL 2000, ch 165, § 2. 34-11A-13. Board of directors--Meeting to elect officers. The board of directors shall meet as soon after the organizational meeting as possible to elect a president, a vice-president, and a secretary-treasurer. Source: SL 1982, ch 259, § 13. 34-11A-14. Terms of directors and officers--Compensation of ambulance district director. All directors and officers shall be elected for two years and hold office until their successors have been elected and qualified, except that at the first election the vice-president shall be elected as provided in § 34-11A-13 for a one-year term, and one-half, or as close to one-half as possible depending upon the total number of directors, of the directors elected at the first election shall be selected by lot in the presence of a majority of such directors to serve one-year terms. An ambulance district director may receive compensation for his services in an amount not to exceed forty dollars per day and may receive expenses, including traveling expenses, necessarily incurred in the discharge of his duties. Source: SL 1982, ch 259, § 14; SL 1988, ch 275, § 1. 34-11A-15. District constitutes body politic and corporate. Upon compliance with the provisions of this chapter relating to organization and upon compliance with chapter 6-10, the district under its designated name shall be and constitute a body politic and corporate. Source: SL 1982, ch 259, § 15. (8) To levy a tax and a special assessment as provided by this chapter. Source: SL 1982, ch 259, § 16; SL 2000, ch 166, § 1. 34-11A-17. Contracts with other districts or agencies authorized. Any ambulance district may elect to enter into a contract with another ambulance district to consolidate or cooperate for mutual service, or may enter into a contract with any federal, state, or local government agency for ambulance service upon suitable terms. Source: SL 1982, ch 259, § 17. 34-11A-18. Annual estimate and certification of expenses--Source of payment. The board of directors may make an annual estimate of the probable expense for carrying out the ambulance service program for the district. The board of directors shall, by resolution, certify the estimate to the proper county auditor in the manner provided by § 34-11A-19. The resolution shall state if the estimate shall be paid by a general tax levy against all taxable real property located within the district, by a special assessment against the real property within the district that is specifically benefited by the project, or by both a general tax levy and a special assessment with a portion to be paid by each. Source: SL 1982, ch 259, § 18; SL 2000, ch 166, § 2. 34-11A-19. Estimate certified--Date. The estimate provided by § 34-11A-18 shall be certified by the president and secretary to any affected county auditor on or before June thirtieth of each year. Source: SL 1982, ch 259, § 19; SL 2000, ch 165, § 3; SL 2000, ch 166, § 3. 34-11A-20. Tax levy--Limitations--Exemption of district from general county levy for ambulance service. No tax in excess of sixty cents per thousand dollars of taxable valuation upon the property within an ambulance district may be levied for such district pursuant to the provisions of this chapter. The amount of money received from the tax levy on all property within the district plus the amount of money received from the imposition of any special assessment within the district may not exceed the amount which would be raised by a general tax levy of sixty cents per thousand dollars upon all property within an ambulance district. In no case may the amount of tax levy exceed the amount of funds required to defray the expenses of the district for a period of one year as embraced in the annual estimate of expenses including the amount of principal and interest upon the indebtedness of the district for the ensuing year. However, no district organized pursuant to this chapter is subject to any general county levy for ambulance service. Source: SL 1982, ch 259, §§ 20, 20A, 21; SL 1989, ch 87, § 15H; SL 2000, ch 166, § 4. 34-11A-21. Tax levy and special assessment--Collection. The tax and the special assessment shall be collected as other taxes and special assessments are collected in the county. Source: SL 1982, ch 259, § 22; SL 2000, ch 166, § 5. 34-11A-22. Tax levy and special assessment--Deposit--Bond of secretary-treasurer. The tax and the special assessment shall be deposited with the secretary-treasurer of the ambulance district, who shall have a surety bond in the amount of at least five thousand dollars. Source: SL 1982, ch 259, § 23; SL 2000, ch 166, § 6. 34-11A-23. Tax exempt organizations--Assessment of property--Annual statement of payments. Any club, lodge, chapter, charitable home, dormitory, state or county fair association, or like organization located within an ambulance district and outside the boundaries of any municipality, shall pay to the board of directors of the district annually for ambulance service such amount as may be agreed upon, but not less than twenty-five percent of the amount which would be levied against such property under the provisions of this chapter if such property were subject to such levy. For the purposes of this section, such property shall be assessed by the director of equalization of the county in which such property lies, or by his deputies. The board of directors shall file an annual statement with the Department of Health showing the names of persons or organizations making payments and the amounts of payments made under this section. Source: SL 1982, ch 259, §§ 24, 25; SL 2004, ch 17, § 208; SL 2015, ch 277 (Ex. Ord. 15-1), § 33, eff. Apr. 20, 2015. 34-11A-24. Limitation on indebtedness--Power to borrow money. No district may become indebted for an amount that is not payable from ten annual maximum tax levies as authorized by § 34-11A-19. With the limits herein authorized, the district shall have power to borrow money at a rate not in excess of twelve percent and to issue appropriate evidence of indebtedness thereof. Source: SL 1982, ch 259, § 26. 34-11A-25. Deposit of funds--Warrant for disbursement. All funds collected on behalf of the district through the levy of taxes; all donations, contributions, bequests, or annuities; and all borrowed money received by or on behalf of the district shall be deposited in a state or national bank to the credit of the district fund and shall be drawn out only by warrant. Source: SL 1982, ch 259, § 27. 34-11A-26. Claim vouchers. Such claim voucher shall be authorized by the board of directors and shall bear the signature of the treasurer and the countersignature of the president of such district. Source: SL 1982, ch 259, § 28. 34-11A-27. Examination of financial reports of secretary-treasurer. When the Department of Legislative Audit examines other county records, it shall examine the financial report of the secretary-treasurer of the ambulance district. The secretary-treasurer of the ambulance district shall, on or before January thirty-first of each year, file a financial report of the previous calendar year with the appropriate county auditor. Source: SL 1982, ch 259, § 29; SL 1988, ch 276. 34-11A-28. Change of district boundaries. The boundaries of any ambulance district organized under the provisions of this chapter may be changed in the manner prescribed for establishment of a district, or the board of directors of an ambulance district may submit a proposed decrease in the size of the district to voters at an annual or special meeting. However, the change of boundaries of a district does not impair or affect the district's organization or right in or to property; nor does the change of boundaries impair, affect, or discharge any contract, obligation, lien, or change for or upon which the district may be liable had the change of boundaries not been made. Source: SL 1982, ch 259, § 30; SL 2000, ch 32, § 5; SL 2000, ch 165, § 4. 34-11A-29. Annual and special meetings of voters--Annual election--Notice of election. A regular meeting of the registered voters who are residing within the boundaries of a district shall be held in the first quarter of each calendar year and special meetings may be called by the board of directors at any time. The annual election shall be conducted during the regular meeting consistent with the provisions of chapter 8-3. Notice of the annual election shall be given by the secretary-treasurer by one publication in a legal newspaper of general circulation in each county in which the district is situated. The meeting shall be held not less than seven days nor more than fourteen days after the date of publication of the notice. Source: SL 1982, ch 259, § 31; SL 2002, ch 144, § 4; SL 2007, ch 75, § 5. 34-11A-30. Report of secretary-treasurer. The secretary-treasurer of the district shall, at each annual public meeting of the district, present a financial report concerning the affairs of the district. Source: SL 1982, ch 259, § 32. 34-11A-31. Capital outlay fund established--Uses. The capital outlay fund of an ambulance district is a fund provided by law to meet expenditures of three hundred dollars or more which result in the acquisition of or additions to real property, plant or equipment. Such an expenditure shall be for land, existing facilities, improvement of grounds, construction of facilities, additions to facilities, remodeling of facilities, or for the purchase of equipment. Source: SL 1992, ch 241, § 1. 34-11A-32. Tax levy for capital outlay fund. In addition to any tax levy authorized pursuant to § 34-11A-19 or 34-11A-20, the board of directors of an ambulance district may authorize an annual levy of a tax not to exceed fifty cents per thousand dollars of taxable valuation on the taxable valuation of the district for the capital outlay fund. Source: SL 1992, ch 241, § 2. 34-11A-33. Public hearing required for certain expenditures of capital outlay fund. Any district using the capital outlay fund for payment of construction of new facilities or construction of additions to facilities, the total of which will require advertising for bids under chapter 5-18, must have a public hearing at least ten days prior to the advertisement of any contract specifications. Such public hearing shall be advertised in the legal newspapers of each county where the district has territory. Following such public hearing, and approval of the board of directors, the district may use the capital outlay fund as provided in § 34-11A-32. However, if a district changes the originally advertised use of the fund it shall hold another public hearing. Source: SL 1992, ch 241, § 3. 34-11A-34. Deferred compensation program for volunteer advanced life support personnel. Any ambulance district with volunteer advanced life support personnel may establish a deferred compensation program for its volunteer advanced life support personnel. Such a program may be financed by the ambulance district or by the volunteer advanced life support personnel and may be managed through the ambulance district or through an insurance company or other financial institution. Such program shall be established by ordinance. Each ambulance district shall establish requirements for participation in the program. Participation in the program of deferred compensation shall be at the option of the volunteer advanced life support personnel. Source: SL 2011, ch 36, § 4. A public hearing will be held Thursday, October 25, 2018 at 10:00 a.m. in the Commission Room of the Erskine Administrative Building on said proposed West-Central Meade County Fire District Resolution. 34-31A-2. Electors' petition to establish district--County commissioners' resolution to initiate proceedings. If an application for organization as provided in § 6-16-2 covering any rural territory is completed and requests to form, organize, establish, equip, and maintain a rural fire protection district, the application shall be filed with the county auditor of each county in which the territory is located. The board of county commissioners in each county where the rural fire protection district would be located may by resolution initiate the formation of the district. Source: SL 1971, ch 208, § 1; SL 1973, ch 226, § 1; SL 1984, ch 241, § 1; SL 1998, ch 36, § 28. 34-31A-3. Inclusion of municipality in district. Any municipality located within the area, whether the municipality has a fire department or not, may be included in the rural fire district if twenty percent of the landowners within the municipality who are also registered voters within the municipality sign a separate petition from that municipality, or if the governing body of the municipality establishes intent by passing a resolution so indicating. Source: SL 1971, ch 208, § 1; SL 1973, ch 226, § 2; SL 1992, ch 60, § 2; SL 1998, ch 36, § 29; SL 2002, ch 144, § 5. 34-31A-4. Contents of petition or resolution--Plat or map. The petition shall contain the suggested name of the proposed district, the area in square miles to be included, and a complete description according to government survey, if possible, of the boundaries of the real properties intended to be embraced in the proposed rural fire protection district. The petitioners shall also present to the county auditor a plat or map showing the suggested boundaries of the proposed district. Source: SL 1971, ch 208, § 1; SL 1973, ch 226, § 3; SL 1998, ch 36, § 30. 34-31A-5. Examination of petition by auditor--Time and place of hearing. Upon the filing of the petition in the office of the county auditor, the county auditor shall determine and certify that the petition has been signed by the number of voters as specified in § 6-16-2. If the petition contains sufficient names, the county auditor shall designate a time and place for the petition or resolution of the county commissioners to be heard by the board of county commissioners. Source: SL 1971, ch 208, § 2; SL 1973, ch 226, § 4; SL 1998, ch 36, § 31. 34-31A-6. Auditor's action where two or more counties included--Time and place of joint hearing. If the proposed district shall be situated within two or more counties, the county auditor of the county wherein the largest area is contained, shall confer with the auditor or auditors of the other counties concerned, and shall obtain a certificate as to the adequacy of the petitions or resolution pertaining to said county or counties, and thereafter he shall designate a time and place for hearing before a joint meeting of the boards of county commissioners of all counties in which the proposed district is to be situated and shall give notice thereof by publication in a manner provided in § 34-31A-7. Source: SL 1971, ch 208, § 2; SL 1973, ch 226, § 5. 34-31A-7. Publication of notice of commissioners' hearing. Notice of the hearing shall be given by publication two weeks in the legal newspapers of each county affected, the last publication appearing at least seven days prior to the hearing. The notice shall include a statement of the proposed boundaries as set forth in the petition. Source: SL 1971, ch 208, § 2; SL 1992, ch 80, § 211; SL 1998, ch 36, § 32. 34-31A-8. County commissioners' hearing on organization of district--Determination and order as to district and boundaries. At the time and place so fixed, the board or boards of county commissioners shall meet, and all persons residing in or owning taxable property within the proposed district shall have an opportunity to be heard respecting the formation of such district or the location of the boundaries thereof. Thereupon the board or boards of county commissioners shall determine whether the proposed district is suited to the general fire protection policy of the county, or each of such counties, as a whole, determine the boundaries of the proposed district, whether as suggested in the petition or otherwise, and make a written order of such determination which shall describe the boundaries of the district and be filed in the office of the county auditor or auditors of each county in which such district is situated. Source: SL 1971, ch 208, § 2. Source: SL 1971, ch 208, § 3; SL 1992, ch 80, § 212; SL 1998, ch 36, § 33. 34-31A-10 to 34-31A-12. Repealed by SL 1998, ch 36, §§ 34 to 36. 34-31A-13. Election of first board of directors. Permanent organization shall be effected by the election of a board of directors consisting of not less than five residents of the district. If the district includes any incorporated municipalities which are located within the boundaries of the district, no more than two members of a five-member board of directors may be voters who are residents of the incorporated municipal areas of the district if at least forty percent of the registered voters of the district live outside the incorporated areas of the district, and no more than three members of the board of directors may be voters who are residents of the incorporated municipal areas of the district if at least twenty percent of the registered voters of the district live outside the incorporated areas of the district. If the board of directors consists of more than five members, the additional members, as nearly as can be accomplished, shall be in the proportions set forth in this section. Source: SL 1971, ch 208, § 4; SL 1976, ch 224, § 1; SL 1981, ch 264, § 1; SL 1986, ch 286; SL 1998, ch 36, § 37. 34-31A-14. Election of officers. The board of directors shall meet as soon after the organizational meeting as possible to elect a president, a vice-president, and a secretary-treasurer. Source: SL 1971, ch 208, § 4. 34-31A-15. Terms of directors and officers--Compensation of rural fire protection district director. All directors and officers shall be elected for two years and hold office until their successors have been elected and qualified, except that at the first election the vice-president shall be elected as provided in § 34-31A-14 for a one-year term, and one-half, or as close to one-half as possible depending upon the total number of directors, of the directors elected at the first election shall be selected by lot in the presence of a majority of such directors to serve one-year terms. A rural fire protection district director may receive compensation for his services in an amount not to exceed forty dollars per day and may receive expenses, including traveling expenses, necessarily incurred in the discharge of his duties. Source: SL 1971, ch 208, § 4; SL 1988, ch 275, § 2. 34-31A-15.1. Filling of vacancy on board of directors. The board of county commissioners shall fill a vacancy on the board of directors of a rural fire protection district by appointing a voter of the district who meets the requirements in § 34-31A-13 to complete the unexpired term. Source: SL 1987, ch 257. 34-31A-16. District as body corporate and politic. Upon compliance with the provisions of this chapter relating to organization and upon compliance with chapter 6-10, the district under its designated name shall be and constitute a body politic and corporate. Source: SL 1971, ch 208, § 17. (7) Generally to perform all acts necessary to fully carry out the purposes of this chapter. Source: SL 1971, ch 208, § 6. 34-31A-18. District contracts with other agencies or nonprofit corporations for fire protection--Validity of contracts. Any rural fire protection district may enter into a contract with another rural fire protection district to consolidate or cooperate for mutual fire protection and prevention purposes, or may enter into a contract with any federal, state, or local government agency for fire protection service or fire protection cooperation upon terms suitable to all concerned. Power to make such contracts is hereby conferred upon such state or local government agency in addition to such powers as are otherwise provided by law. Any rural fire protection district may enter into a contract with any nonprofit corporation, organized under the laws of this state and whose sole purpose is fire protection, for fire protection service or fire protection cooperation upon terms suitable to all concerned. Any contract between a rural fire protection district and a nonprofit corporation that was entered into prior to July 1, 2005, and which now complies with the provisions of this section is hereby declared to be valid and legal. Source: SL 1971, ch 208, § 10; SL 2005, ch 192, § 1. 34-31A-19. State system of rural fire protection routings. The Department of Public Safety, with the advice and cooperation of the South Dakota Firemen's Association may establish a system of rural routings which shall be as uniform as is practicable throughout the state, for the purpose of aiding rural fire-fighting equipment and other emergency vehicles in locating and arriving quickly at the scene of a fire or other emergency within any area which they might logically be called upon to serve. Source: SL 1971, ch 208, § 16; SL 2003, ch 272, §§ 20, 121. (2) Annually certify an estimated tax levy request in dollars to the proper county auditor in the manner provided by § 34-31A-21. The estimated tax levy request shall be determined by subtracting the grants, resources of fire departments within the district, and other revenues from the prepared budget. Source: SL 1971, ch 208, § 6 (2), (3); SL 1994, ch 279. 34-31A-21. Certification of budget estimates to county auditor--Tax levy. The president and secretary shall certify the estimate provided by § 34-31A-20 to the proper county auditor or county auditors, on or before October first of each year. The auditor shall levy a tax not to exceed one dollar per thousand dollars of taxable valuation upon the taxable property within the district for the maintenance of the fire protection district for the fiscal year as provided by law. Source: SL 1971, ch 208, § 7; SL 1976, ch 224, § 2; SL 1981, ch 265, § 1; SL 1998, ch 212, § 1. 34-31A-22. Maximum tax levy. The rate of tax for functions authorized by this chapter may not exceed sixty cents per thousand dollars of taxable valuation in the rural fire district for the purchase of rural fire-fighting equipment in rural fire districts or for the purpose of assisting and contributing to the purchase and upkeep of fire-fighting equipment in adjoining first or second class municipalities or villages. Source: SL 1971, ch 208, § 14; SL 1984, ch 241, § 2; SL 1989, ch 87, § 15I; SL 1992, ch 60, § 2. 34-31A-23. Tax levy not to exceed estimates of expenses. In no case shall the amount of tax levy exceed the amount of funds required to defray the expenses of the district for a period of one year as embraced in the annual estimate of expenses including the amount of principal and interest upon the indebtedness of the district for the ensuing year. Source: SL 1971, ch 208, § 7. 34-31A-24. Collection of taxes. Said tax shall be collected as other taxes are collected in the county. Source: SL 1971, ch 208, § 7 (1). 34-31A-25. Tax proceeds to secretary-treasurer--Surety bond. Said tax shall be turned over to the secretary-treasurer of the rural fire protection district, who shall have a surety bond in the amount of at least five thousand dollars. Source: SL 1971, ch 208, § 7 (2). 34-31A-26, 34-31A-27. Transferred to §§ 34-31A-32, 34-31A-33. 34-31A-28. Fire protection payments by tax-exempt organizations--Minimum--Assessment. Any club, lodge, chapter, charitable home, dormitory, state or county fair association, or like organization located within a rural fire protection district and outside the boundaries of any municipality, shall pay to the board of directors of the district annually for fire protection such amount as may be agreed upon, but not less than twenty-five percent of the amount which would be levied against such property under the provisions of this chapter if such property were subject to such levy. For the purposes of this section, such property shall be assessed by the director of equalization of the county in which such property lies, or by his deputies. Source: SL 1971, ch 208, § 15; SL 1976, ch 224, § 3. 34-31A-29. Annual statement of payments by tax-exempt organizations. The board of directors shall file an annual statement with the Department of Public Safety showing the names of persons or organizations making payments and the amounts of payments made under § 34-31A-28. Source: SL 1971, ch 208, § 15; SL 2003, ch 272, §§ 20, 121. 34-31A-30. Expenditure of payments by tax-exempt organizations. Funds derived from payments pursuant to § 34-31A-28 shall be expended by the district for fire-fighting supplies and equipment and the training of fire department personnel. Source: SL 1971, ch 208, § 15. 34-31A-31. Maximum indebtedness of district--Borrowing power. No district may incur debt greater than an amount equal to twenty times the annual maximum tax levy as authorized by § 34-31A-21. A district may borrow money and issue appropriate evidence of indebtedness within the limits authorized by this section. Source: SL 1971, ch 208, § 8; SL 1983, ch 28, § 27; SL 1990, ch 277. 34-31A-32. Deposit in bank of district receipts--Warrants for disbursement. All funds collected on behalf of the district through the levy of taxes; all donations, contributions, bequests, or annuities; and all borrowed money received by or on behalf of the district shall be deposited in state or national bank to the credit of the district fund and shall be drawn out only by warrant. Source: SL 1971, ch 208, §§ 7 (3), 9; SDCL Supp, § 34-31A-26. 34-31A-33. Claim vouchers for district funds. Such claim voucher shall be authorized by the board of directors and shall bear the signature of the treasurer and the countersignature of the president of such district. Source: SL 1971, ch 208, §§ 7 (4), 9; SDCL Supp, § 34-31A-27. 34-31A-34. Filing of financial report with county auditor--Examination of district records. The secretary-treasurer of the rural fire protection district shall, on or before January thirty-first of each year, file a financial report of the previous calendar year with the proper county auditor or county auditors. When the Department of Legislative Audit examines other county records, it shall examine the financial report of the secretary-treasurer of the rural fire protection district. Source: SL 1971, ch 208, § 9; SL 1986, ch 287. 34-31A-35. Change of district boundaries--Prior rights unimpaired--Liability for debts. The boundaries of any rural fire protection district organized under the provisions of this chapter may be changed in the manner prescribed by §§ 34-31A-5 to 34-31A-11, inclusive, but the changes of boundaries of any such district may not impair or affect its organization or its right in or to property; nor may it impair, affect or discharge any contract, obligation, lien, or charge for or upon which it might be liable had such change of boundaries not been made. Any portion or area of land which was part of a rural fire district, organized under §§ 34-31A-5 to 34-31A-11, inclusive, and which is annexed into a bordering municipality, is liable for any indebtedness incurred while within the boundaries of the fire district. Nothing in this section may preclude a municipality, by ordinance, when annexing land within a rural fire protection district, of assuming a portion or all of the indebtedness on the annexed land which is a result of being in the rural fire protection district. Source: SL 1971, ch 208, § 12; SL 1983, ch 258. 34-31A-36. Procedure for annexation of territory. Any territory which is adjacent to the boundary of an existing rural fire protection district may be annexed to such district in the manner provided in §§ 34-31A-37 to 34-31A-42, inclusive. Source: SL 1971, ch 208, § 11. 34-31A-37. Annexation resolution or petition filed with county auditor. The proceedings for the annexation, referred to in § 34-31A-36, may be initiated by resolution or by the presentation to the auditor of a petition signed by ten percent of the electors who are owners of any interest in real property assessed for taxation in the territory to be annexed and who are residing within the boundaries of such territory stating the desires and purposes of such petitioners or governmental body. The petition or resolution shall contain a description of the boundaries of the territory proposed to be annexed. It shall be accompanied by a map or plat and a deposit for publication costs. Source: SL 1971, ch 208, § 11 (1); SL 1973, ch 226, § 6; SL 1992, ch 80, § 215. 34-31A-38. Auditor's examination of annexation petition--Papers forwarded to directors. The county auditor shall consult the tax schedules in the office of the county auditor and determine and certify whether or not such petition complies with the requirements of § 34-31A-37 and that the persons signing the same appear to reside within the boundaries described by such petition. Thereafter, the county auditor shall forward such petition, resolution, map or plat, and certificate to the board of directors of the district concerned. Source: SL 1971, ch 208, § 11 (2); SL 1973, ch 226, § 7. 34-31A-39. Transmittal of annexation petition or resolution to county board--Approval or disapproval by directors. Within thirty days after receiving the petition or resolution, map or plat, and certificate of the county auditor, in accordance with § 34-31A-38, from the county auditor, such board of directors shall transmit the same to the proper county board, accompanied by a report in writing approving or disapproving the proposal contained in said petition, or approving such proposal in part and disapproving it in part. Source: SL 1971, ch 208, § 11 (3); SL 1973, ch 226, § 8. 34-31A-40. Annexation petition rejected if directors disapprove. No area shall be annexed to an existing rural fire protection district contrary to the recommendation of the board of directors of such existing district. If the report of the board of directors, referred to in § 34-31A-39, disapproves the proposal, the petition shall be rejected. Source: SL 1971, ch 208, § 11 (4), (5). 34-31A-41. Notice of commissioners' hearing on annexation petition. If the report of the board of directors, referred to in § 34-31A-39, is favorable to such proposal, either in whole or in part, the board of county commissioners shall promptly designate a time and place for a hearing upon the petition and shall give notice thereof in the manner prescribed by § 34-31A-7. At such hearing, any person owning taxable property or residing within the boundaries of the existing district or the territory to be annexed, shall have the opportunity to be heard respecting the proposed annexation. Source: SL 1971, ch 208, § 11 (4). 34-31A-42. 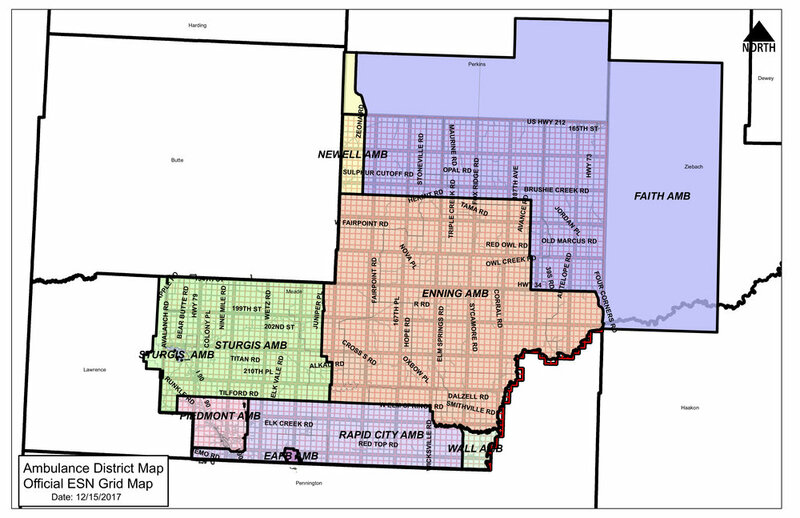 County commissioners' determination on proposed annexation. The board of county commissioners shall, at or shortly after the hearing referred to in § 34-31A-41, determine whether such territory should be annexed to the existing district and shall fix the boundaries of the territory to be annexed. The determination of the board of county commissioners shall be set forth in written order which shall describe the boundaries determined upon and shall be filed in the office of the county auditor. Source: SL 1971, ch 208, § 11 (5). 34-31A-43. Annual meeting of registered voters of district--Special meetings--Annual election--Notice of election. A regular meeting of the registered voters who are residing within the boundaries of a district shall be held in the first quarter of each calendar year and special meetings may be called by the board of directors at any time. The annual election may be conducted during the regular meeting consistent with the provisions of chapter 8-3. Notice of the annual election shall be given by the secretary-treasurer by one publication in a legal newspaper of general circulation in each county in which the district is situated. The meeting shall be held not less than seven days nor more than fourteen days after the date of publication of the notice. Source: SL 1971, ch 208, § 5; SL 1992, ch 80, § 216; SL 2002, ch 144, § 6; SL 2007, ch 75, § 6; SL 2014, ch 171, § 1. 34-31A-44. Secretary-treasurer's report at annual public meeting. The secretary-treasurer of the district shall, at each annual public meeting of the district, present a financial report concerning the affairs of the district. Source: SL 1971, ch 208, § 9. 34-31A-45. Deferred compensation program for volunteer firefighters--Establishment and management--Participation optional. Any rural fire protection district with a volunteer fire department may establish a deferred compensation program for its volunteer firefighters. Such a program may be financed by the rural fire protection district or by the volunteer firefighters and may be managed through the rural fire protection district or through an insurance company or other financial institution. Such program shall be established by ordinance. Each fire protection district shall establish requirements for participation in the program. Participation in the program of deferred compensation shall be at the option of the volunteer firefighter. Source: SL 1986, ch 71, § 4. 34-31A-46. Election by territory residents on annexation of territory. The residents of any territory proposed to be annexed into a rural fire protection district may, by petition, call for an election on such annexation. The petition shall be signed by five percent of the voters residing within the territory included within the proposed annexation. The petition shall be submitted within twenty days of the district's governing body's vote to propose the annexation. The election shall be held within ninety days of the submission of the petition, but if the petition is submitted within one hundred twenty days of a regularly scheduled election of the rural fire protection district, the governing body of the rural fire protection district may place such question on the regular election ballot. The election on the annexation shall be voted upon only by those residing within the territory proposed to be annexed, and shall be decided by majority vote. Source: SL 1995, ch 198. 34-31A-47. General election combined with regular municipal election. The board of directors of a rural fire protection district may choose to hold a rural fire protection district general election in conjunction with a regular municipal election. The combined election is subject to approval by the governing body of the municipality. The combined election shall be held on the regular date for the general municipal election. Expenses of a combined election shall be shared in a manner agreed upon by the governing bodies of the rural fire protection district and the municipality. All other governmental responsibilities associated with holding elections shall be shared as agreed upon by the governing bodies. Source: SL 2014, ch 171, § 2.